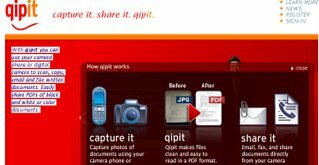 Qipit is a website that lets you use your camera phone or digital camera to scan, copy, email and fax written documents, it will convert to PDF file. Easily share PDFs of black and white or color documents. It is similar with another site Scanr.